Sometimes when people ask where I’m from, I don’t know how to answer. Originally from? Currently from? Recently from? In my early adult life I’ve lived in 4 different states (Illinois, Oklahoma, Ohio, and Michigan). Originally from Chicago, currently from Michigan, and most recently from Ohio. The lovely Oklahoma was thrown into the mix after Illinois. Having a close “network” is something I’ve learned to live without. It’s something I want, but with such frequent relocation, it’s challenging to achieve. When I’m back in Chicago, it feels most like home. There’s familiar faces and more of a network for me than anywhere else. This past weekend when I was visiting my family in Chicago, I visited the gym twice. (In addition to living in multiple states, I also belong to multiple gyms…one of which is back in Chicago and thanks to my parent’s “family membership”). I was proud of my two trips to the gym — finding the motivation with so much else to do can be challenging. As I was leaving the gym on Saturday, one of the front desk employees (who I know) jokingly asked if I was going to return to Ohio for the birth of the baby so the baby could be an OSU buckeye. Of course my response was an eye roll and a, “Heck no! Baby will be an Illini fan with 2 alumni parents!” A young girl who was also working the front desk overheard and shared that she attends the University of Illinois. I asked where she lives on campus and when she said her sorority house, I had to ask which sorority. When she said “Delta Zeta”…it’s possible I squealed. What are the chances, especially 2 1/2 hours from campus? Of course her graduation date is….nearly 10 years after mine and I found myself saying things like, “When I went to school there, blah blah blah was called blah blah blah” and “We used to hangout at blah blah blah and with blah blah blah frat.” In the end, I just felt old…yet grateful for 4 wonderful years in college that I wouldn’t trade for the world. Now, instead of bar hopping and chasing boys (one specifically who I now call Mr. P), I spend my Saturdays making salads, photographing them and posting them to Instagram, and sending them to my coworker saying, “WE HAVE TO SERVE THIS AT THE HOSPITAL NEXT WEEK! !” And that’s just what we did. 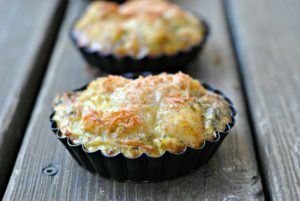 Let’s just say I’m not the only one who is head over heels for this recipe. It’s uhhhhhhhhmazing. 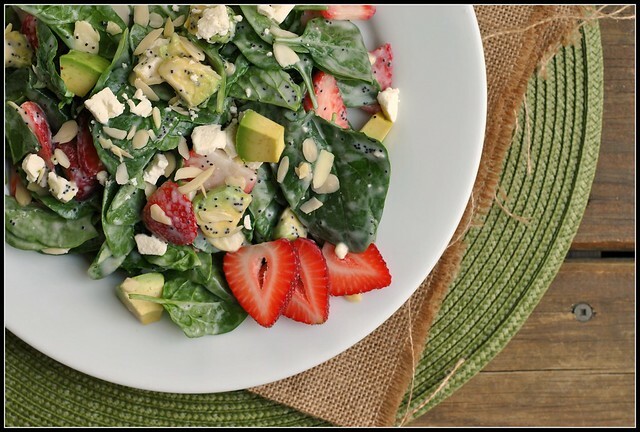 This recipe makes 3 entree salads or 6-7 side salads...however, it's too good to stop after a side salad portion. Promise! 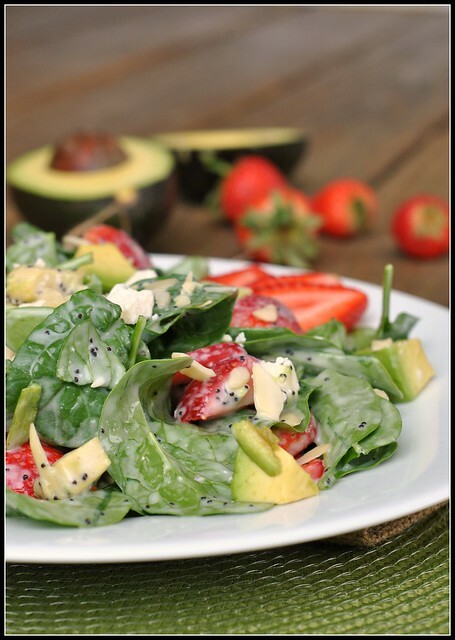 In a large salad bowl, combine salad ingredient and toss to mix. In a small bowl, whisk together the dressing ingredients. Pour dressing over salad and toss well to distribute. Serve salad immediately. Only 2 more days until we find out the gender of baby! Ahhh! Sometimes, time stands still 🙂 Trying to keep busy to keep from obsessing! We just had this salad last week (thanks to your weekly menu for inspiration)! It was so delicious. 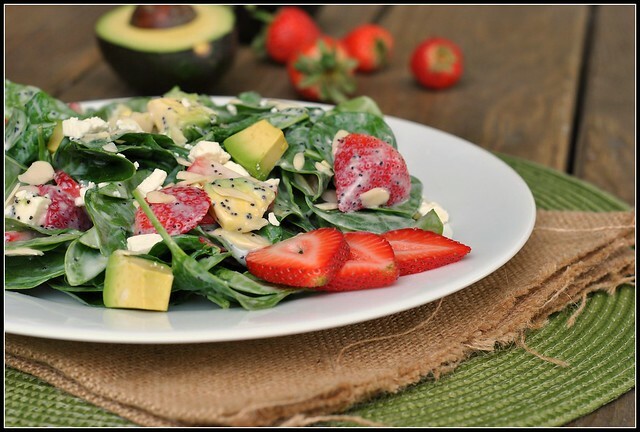 I think it will be my go to salad this summer, especially if my strawberries grow well. I felt the same way after graduating college! It feels like such a long time ago, but the memories are truly going to be remembered fondly over and over. 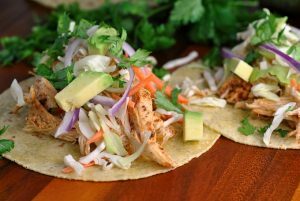 Thanks for the recipe, it looks delicious and definitely something I have to try this summer! 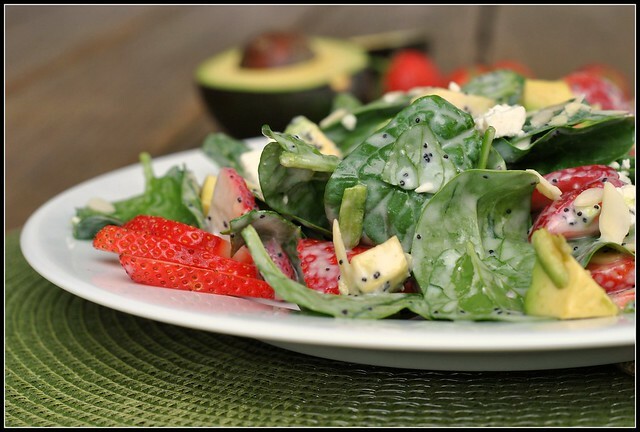 That’s similar to a salad my daughter loves at her work Panera – she just texted me last week and said “the strawberry poppy seed salad is back!” I’ll have to send her this link. Yep, when I go back to Oak Park it is like a homecoming – my husband just gets used to the idea that I will run into someone I know when we go there! Eeek! So happy about finding out the gender – either way I know you will be happy it’s healthy!